If you’re having a low risk birth in a public hospital you likely won’t stay in the hospital for more than two nights. Which means you don’t need to pack too much in your hospital bag. With my second baby I planned to give birth and then head home around 6 hours later, but I packed enough for a one night stay, just in case. If you’ve read my birth story you’ll know that things didn’t quite go to plan and I only spent 3 hours at the hospital. Most of that time was spent having skin-to-skin in the early morning hours so I barely touched my bag. But if I had stayed longer I know I would have used most things in my bag. If you’ve been reading lists that seem way too long and convoluted, this is a short and simple packing list for you. TIP: When packing clothes to wear after your birth, don’t pack anything too tight or too fitted. Size up or bring clothes that you wore when you were around 6 months pregnant. Your belly won’t go down straight away and you’ll want to wear clothes that will be comfy. Darker colours are best as there will be lots of blood and other bodily fluids that may end up on your clothes. TIP: People always wonder what size to pack for baby. I packed 0000 for both my boys and they fit both of them perfectly. Unless you’re measuring smaller than normal or larger than normal, I think 0000 will work out fine. And if does happen to be a size too big or too small, you can have your partner or parents bring you whichever size your baby needs. 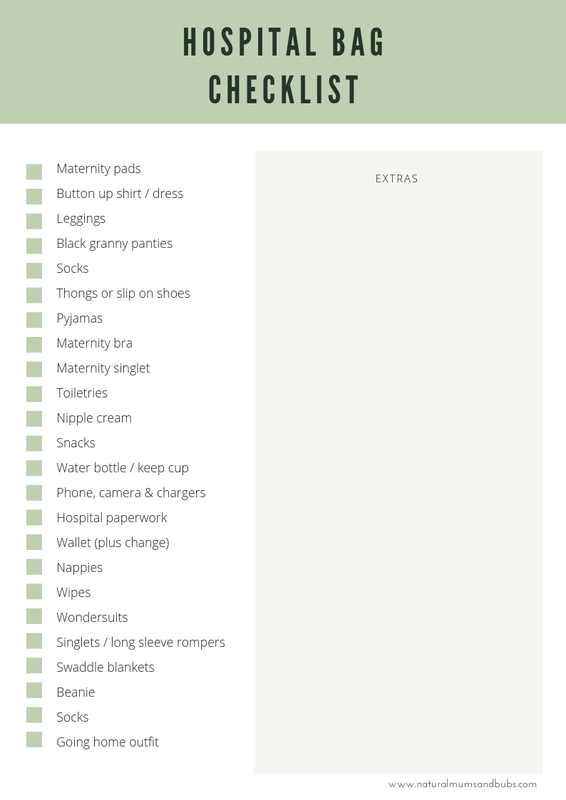 This list may be enough for you or you may like to pack some extras. Some suggested extra items to bring include the following. TIP: Don’t forget to check what your hospital provides. Some hospitals will provide pads, nappies and wipes. You’ll likely be provided with blankets for baby and possibly even a singlet or beanie. It’s also worth checking what equipment your hospital has for labour. Some will provide birthing balls to use, while others may not. * All links included are to products that I purchased and packed in my hospital bag. They are in no way sponsored and the links are not affiliate links.